At last, it’s prime time for Tamron as the lensmaker enters the fray with a brand new pair of fast, up-market lenses. Find out how they perform in our Tamron SP 35mm and 45mm f/1.8 review. They’re a bit like buses – you wait ages for a Tamron prime lens to turn up (macro optics aside), then two arrive at once. The new 35mm and 45mm lenses have essentially the same design criteria and look incredibly similar, apart from the 45mm lens being physically longer by 11mm, and 60g heavier. Here’s what they have in common. Both have pro-grade build quality which includes metal lens barrels, weather-seals and a wonderfully refined and well-engineered feel to the two lenses. Switches are large and easy to operate, even with icy winter fingers, while the manual focus rings are silky-smooth and very precise. Overall, handling is a complete joy. Unlike the pricier Sigma f/1.4 Art series of prime lenses, the Tamron duo are two-thirds of a stop slower with a widest available aperture of f/1.8. It’s worth noting, however, that the Sigma lenses don’t have weather-seals and lack optical stabilization. Both additions are welcome in the Tamron lenses, especially VC (Vibration Compensation), which gives a benefit equivalent to about four stops. On full-frame cameras, the 35mm lens has a classic, moderately wide viewing angle of 63 degrees, whereas the 51 degrees of the 45mm lens makes it a ‘standard’ prime, to all intents and purposes. Further attractions include close minimum focus distances, and USD (Ultrasonic Silent Drive) autofocus, which is fairly fast, ultra-quiet and has the usual full-time manual override. High-tech, top-quality glass includes moulded aspherical elements and LD (Low Dispersion) elements, while the 35mm lens also adds an XLD (eXtra Low Dispersion) element. Both lenses use eBAND and BBAR nano-technology coatings to reduce ghosting and flare, and both have additional fluorine coatings to repel muck and help make the front element easier to clean. Throughout our lab tests, the Tamron lenses didn’t exactly blow us away with sharpness scores. 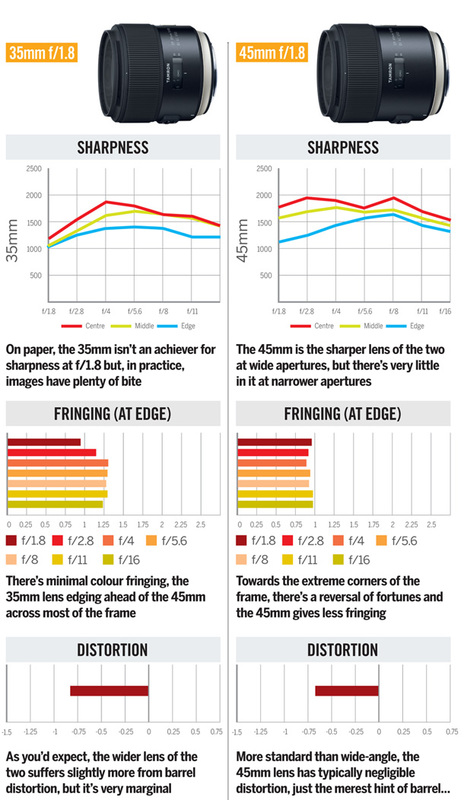 Instead, results indicated levels of sharpness that are slightly below average for this class of lens. In real-world testing, however, we were really impressed at the ability of both lenses to deliver images with real bite and great contrast, even under dull lighting conditions at their widest f/1.8 aperture. Stopping down a little, the nine-blade diaphragms maintain well-rounded apertures which help to keep a smooth appearance for defocused areas. Naturally, it’s easier to get a tight depth of field with the 45mm lens, compared with the wider-angle 35mm lens. Even so, the close focusing abilities of both lenses make it possible to blur out the background if you can shoot from close to the main subject. Colour fringing and distortions are minimal, and vignetting is also well controlled, even when using the widest available f/1.8 aperture. Overall performance is very impressive and image quality is a good match for the up-market design and precision build of these new Tamron lenses. A step up from the Canon EF 35mm f/2 IS USM, this new Tamron inspires confidence with its excellent build quality, clever design and great handling. Even so, it could be a little sharper at f/1.8. Marginally wider than a 50mm lens, this 45mm optic is nevertheless a great choice as a fairly fast standard lens for full-frame cameras or as a portrait lens for APS-C format bodies.